Seven years before our story opens, Carstares protected his brother by allowing himself to be disgraced for cheating at cards. His brother, suffering intense guilt, isn’t aware that they played right into the hands of the Duke of Andover. The disgraced Earl now roams the countryside until a confrontation with his rival thwarts the attempt to kidnap the lovely Diana. But now the Duke is more determined than ever to have Diana for his own, and the two men will meet at sword point before the Earl’s name can be cleared and he can claim his fair lady. If Venetia is one of Georgette Heyer’s best novels, The Black Moth is one of her worst. But since this was the very first book she ever wrote, at the young age of 17, we can easily forgive that, don’t you think? After all, all good writers need time and practice to grow and improve and Heyer soon became so good that not only she invented the Regency romance novel as we know it now, but also brought that world to life again. The author has always had a great eye for details and has always made sure that her characters talked, dressed and behaved just like people did in the Regency era. Heyer’s fans can’t help but be disappointed by The Black Moth, but overall, as a first effort, it’s not bad at all. To start with, The Black Moth is set in 1751, so we are in Georgian England instead than Regency England. Jack Carstares, Earl of Wyncham, is exiled from polite society, and his family, because he cheated at cards. Only that he didn’t. His brother Richard did, and he took the blame. The reason? Richard was madly in love with Lavinia Belmanoir, and had he been caught cheating, he couldn’t have married her. Years passed. Richard is married to Lavinia, but feeling guilty for what he did to his brother and anxious to make amends, while Jack has become a highwayman. One day, pretty much halfway through the book, Jack saves Diana Beauleigh from the clutches of Tracy Belmanoir, Lavinia’s brother and Duke of Andover, who’s trying to kidnap her. He’s in love with her and wants to marry her, but he knows that she’ll turn him down so, in his mind, this is his only option. Lavinia instead falls in love with Jack but, being a highwayman, he can’t marry her. Although they are their main characters in the story, their romance isn’t nearly as interesting as that of Richard and Lavinia. Richard may have got the woman of his dreams, but he knows he’ll lose her if he ever comes clean. Yet, he’s feeling too guilty not to and in the end, he will have to choose between his wife and his brother. The Duke of Andover is also a very intriguing character. He’s nicknamed The Devil, which tells us what an amoral rake he really is, and how he doesn’t hesitate to use whatever means necessary to get what he wants, but yet, he’s not completely evil. There’s still some good in him and, by the end of the book, the reader can’t help but feel sorry for him. All the characters are actually likable and well-drawn. It’s lovely to witness how they grow as the story progresses. The Black Moth has a dramatic plot full of romance, adventure, melodrama and fun. The story is very well-written too, although the typical Georgian expressions used by the author can sometimes be difficult for the modern reader to understand, which slows the book down, but only slightly. 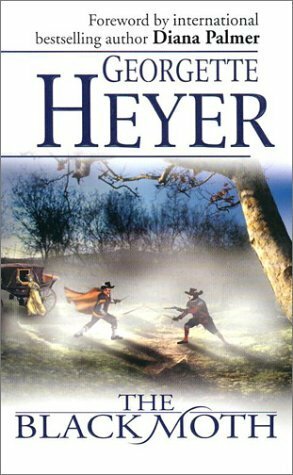 Although in my review of Venetia I mentioned that was a great place to start exploring Heyer’s works, I think The Black Moth would be an even better option. It may not be as good, but by starting at the beginning, you’ll get a better sense of how the author’s style has evolved during the years. You’ll also enjoy this book a lot more if you haven’t read her superlative ones yet. The Black Moth is Georgette Heyer’s first novel. Set in Georgian England, it is packed with adventure, romance, drama, fun and intriguing characters. The story is very well-written but the use of typical Georgian expressions can slow down the book a bit if you’re not familiar with them. Also, the subplots are actually more interesting than the main storyline.